For their next Christmas show a choir I belong to is doing an intriguing song called Hope for Resolution. This involves the weaving together of an English hymn, Of the Father's love begotten and a Zulu song, Thula sizwe (‘Be still, my country’). Many years ago I attended an elementary course of Zulu at SOAS, which included a detailed account of the phonetics. Zulu is a wonderful language for exemplifying speech sounds with different airstream mechanisms, since its sound system includes not only ejectives and implosives, but also clicks — plain, aspirated, voiced, nasalized, and breathy-nasalized. And there are alveolar lateral fricatives and affricates and even a velar lateral affricate ejective. Jehovah will conquer for you. Freedom, we will find/get it. I haven’t been able to check this with a native speaker, so if anyone knows better please do not hesitate to tell me. Zulu has high, low, and falling tones, but with the exception of thúla, -khâla and -thóla I do not know what the tones in these words are. Zulu morphology is highly agglutinative. For example, the word uzokunqobela (‘he will conquer for you’), is made up of u- (subject concord), -zo- (future tense marker), -ku- (object concord), -nqob- (verb root, ‘conquer’), -el- (“applied” suffix, do something on behalf of someone else), -a (ending). Certain Zulu voiced consonants, known as depressor consonants, have a lowering effect on the tone of the following vowel. Among them are the pulmonic-air voiced obstruents, but not the voiced implosives. This is relevant to the perception of the phonemic contrast between plain voiced plosives and implosives. The implosives are only very mildly implosive and the main auditory difference between them and the plain voiced plosives is that plain [b] and [ɡ] are depressors, while weak-implosive [ɓ] and [ɠ] are not. 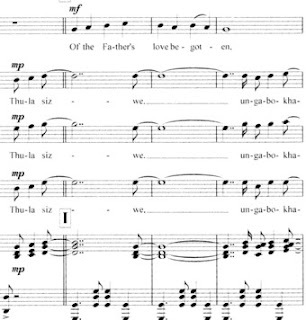 In singing, though, such tonal subtleties are naturally lost. But I don’t think I shall be able to resist defiantly pronouncing the nasalized click in its proper place in uzokunqobela. Interesting how easy it is to prime the brain - I automatically started deciphering the url as 'Lesbian and Gay Men's Choir' - wait hwut? My high school choir sang this song one year. We had a South African exchange student who spoke Zulu, and like you, he absolutely insisted on the click. I don't recall him even mentioning the implosives. We ended up singing something like your transcription, with the click (probably the wrong click, though, as the guy was a native speaker of Afrikaans, spoke quietly with a heavy accent, and spent only about 15 minutes with us). But if a high school choir can manage something of a click, surely you guys can do it properly. One thing about singing the words is that you don't have to worry about the tones. I sang this song in 1995 with my choral group and I remember it well to this day. As far as I can tell your phonetics and click placement is exactly right. Either that, or all of us have been doing it incorrectly =) Search "thula sizwe" on YouTube and you will find many versions of it. Also, note that there is a men's choral group named "Thula Sizwe" that sing traditional Zulu style songs, but I do not know if they have sung this exact song. AD 348-413. Music: Plainsong mode V, 13th century. Our choir is learning Thula Sizwe and I'd love to access this file to hear the accurate pronounciation. Alas the 'Sing Africa' website seems to have been taken over by an oil supplier - Barton Petroleum! Any ideas where 'Sing Africa' has gone? I just wanna know the story of Thulasiswe, is there any? How do you pronounce the word Thula? Is it a hard T - leave out the h sound?